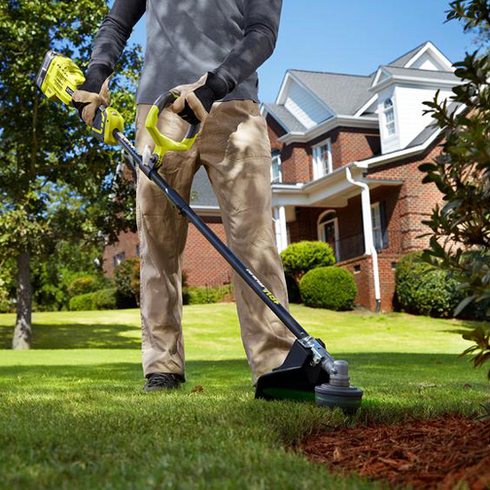 18V ONE+™ LITHIUM+™ Brushless String Trimmer is rated 4.7 out of 5 by 815. Rated 5 out of 5 by OldLakeGeorge from Powerful, convenient, and light I have been hearing really great things about Ryobi's line of One+ tools, so I decided to retire my old gas-powered trimmer and try this battery-powered unit. I have to admit I was a little skeptical that this unit would have enough power to compare to the gas engine. Well, I was very pleasantly surprised and convinced after I've now had a chance to use this trimmer about 5 times over the last month. It has plenty of power, can do my entire yard in one battery charge, and I can't believe how light it is. My back and arms don't hurt any more after a round of trimming. This is a real winner! Do like I did and upgrade to this unit now! Rated 5 out of 5 by rarms1965 from Great trimmer! Used for first time two days ago..., it is a strong and comfortabme to handle tool! Have other Ryobi tools and can't complain. 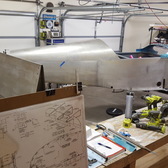 No more hassle with the gas mixture or its storage. The best! Rated 5 out of 5 by theupsman from No more gas! I was in the market for another weed trimmer and continued to look in the gas trimmer section. I saw the battery operated ones and thought they didn't come close to a gas one. I went home and did some more research, boy was I wrong. Fortunately, a Ryobi representative was there once I made a decision to buy. He answered more questions I had, even some I already knew, and I was sold, especially since the was a sale on batteries for but one get one free. I've had the new Ryobi for about two months now. two of my neighbors saw what I was using and they borrowed it. Now three on my block have gone the gasless route. I've never looked back. Rated 5 out of 5 by Womprat53 from Skeptic no more! I usually don't write reviews, but this time i have to! I bought the kit with the 4Ah battery and charger when my Gas powered finally died. (homelite, 11 yrs. old, R.I.P.) Was worried it would handle like some of the other cordless trimmers, but what a surprise! I've used 3 different brands in the past and didn't like any of them for one reason or another, but it all came down to power. Nothing beats a gas powered! After using this one, my whole attitude has changed! 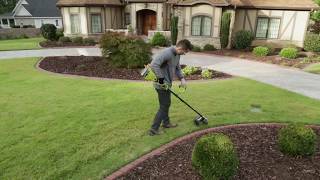 RYOBI has outdone themselves with this brushless trimmer. More power than any other i've used and then some! Great product, in a great product line, for a very good value. Rated 5 out of 5 by leopa from Easy assembly and use Went to buy replacement battery for older Ryobi tools (I could not find where I put them) I needed a new string trimmer. I bought this new brushless string trimmer with battery and charger. It was easy to assemble. Charged battery. Trimmed front of my home (had to stop due to rain). Worked great. Works as well as the older gas powered one that broke months ago (it was more than 10 years old) Now I have a new battery, charger, and string trimmer at a reasonable cost. I will buy extra batteries for the older tools ( They work great with the new battery). All the Ryobi tools I have used have worked well for intended use. Rated 5 out of 5 by outdoorxman from Yard work is fun again! I purchased this when my gas trimmer died a few weeks ago. I was skeptical of an electric unit but it has plenty of power. It never bogs down like the gas unit and I usually run it on the LOW setting. I also have the electric blower and now I use the battery between the two. I still have 3/4 power in the battery after trimming the yard and blowing off the concrete. My only complaint is with the string used on trimmers. It is constantly breaking off. This new trimmer uses a string that looks more like licorise and seems to last much longer. Very happy with this product. If it is like any other Ryobi product, I will have it for many years to come. Rated 5 out of 5 by Webfarmer from This thing just plain works! Trimmer was delivered today and very easy to assemble. Being retired, you do what you want - when you want. So I immediately set out to trim under yard trees and paths to two deer stands. Truth be told, the paths had been mowed not so long ago. Still, plenty of new growth to test the Ryobi. When the job was done, so was the 4.0 ah battery. I ran it on high speed so now know how much it can do before needing a battery swap. Totally acceptable! Lightweight, pretty quiet and just as powerful it seemed as my gas trimmer. Seems like I add some new 18V + One tool every couple weeks. Why? No bad surprises and they just plain work! Rated 5 out of 5 by martinilinn from Awesome Ryobi Brushless String Trimmer I have a plug in string trimmer first, it's doing good trimming jobs, later bought a gas engine trimmer, doing a fantastic trimmer job, but few years later, due to not enough gas oil mixture, got funny noise in the cylinder, so no longer using it, got this latest brushless trimmer, so far I've only been using in LOW setting, it's got plenty of power already, really love the convenient of 18V battery operation, which I got several batteries already, this make it so easy just pick up and go, when the battery is dead, a good sign to take a break, plug in another battery later to continue, no more wires to drag or gas to mix anymore, what an awesome trimmer, highly recommended. 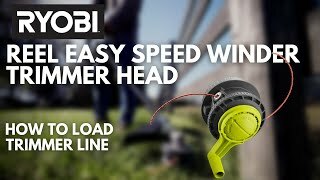 RYOBI is continuing to change the landscape of 18-Volt string trimmers by delivering superior power that rivals that of gas with the ONE+ Lithium+ 18-Volt Brushless String Trimmer. This trimmer has a brushless motor for maximum power and durability. For fast and simple reloads, this trimmer is equipped with the REEL EASY with Speed Winder Bump Feed Head, and can be reloaded in 60 seconds or less. The variable speed trigger and 2-speed switch delivers increased control for any application. The adjustable 11 in. - 13 in. cutting width allows you to optimize your trimmer for increased run time or a wider cut swath. This light weight and well balanced trimmer also has an adjustable front handle for user comfort and is equipped with a 4.0 Ah battery for extended run time. 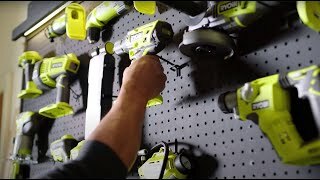 The battery and charger that are included are compatible with over 70 tools on the Ryobi ONE+ system. Backed by a 3-year warranty.